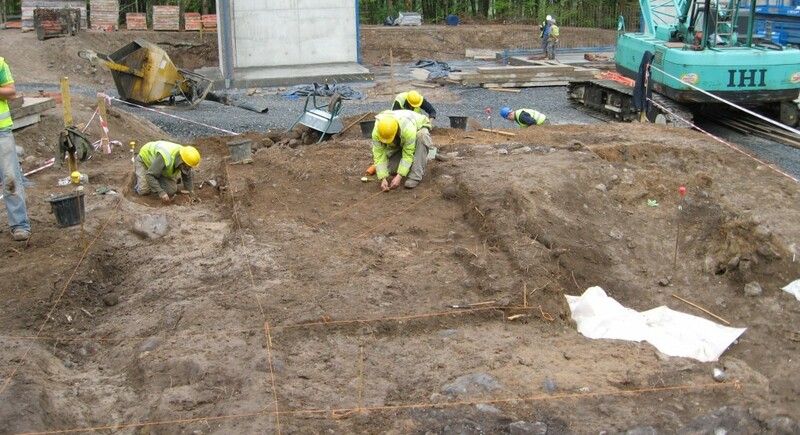 Our site investigation services range from small-scale archaeological test trenching to large open-area excavations. This service is relevant to large or small-scale urban developments, rural green-field developments and large infrastructural projects. These programmes are executed in tandem with desk-based assessments and early risk appraisal studies in order to establish a predictive model for the site. Archaeological Excavation involves “the scientific removal and recording of all archaeological features, deposits and objects to the level of geological strata or the base level of any given development. Full archaeological excavation is recommended where initial investigation has uncovered evidence of archaeologically significant material or structures and where avoidance of the site is not possible”, (DAHGI, 1999). Moore Group Archaeologists have excavated sites throughout Ireland, ranging from fulachta fiadh to large enclosures and settlement sites and burial grounds.